Bloom Time and Color: Purple flowers from late spring to mid summer. Description: This plant is strong growing and somewhat resembles the Lupine, being peashaped. The flowers grow on a spike about 6 inches long. 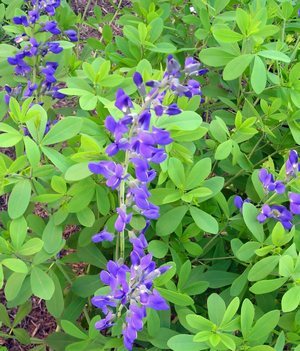 False Indigo grows about 3 feet high and dark bluish-green leaves cut very deeply to form three oval leaflets. These are very striking plants for the border because of the excellent spikes of blue color. They are also good in the wild garden.